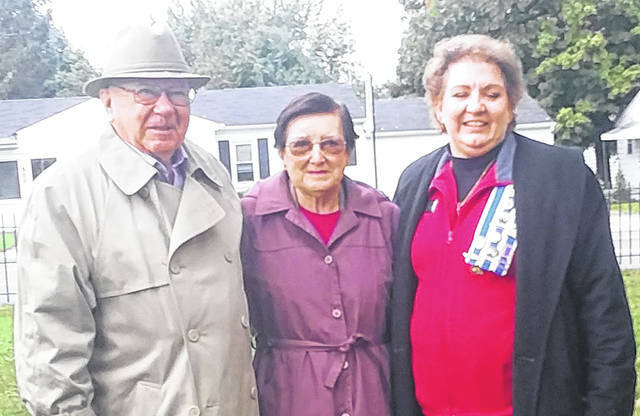 Betty Driever, center, has been made an Urbana DAR Chapter honorary regent. A tree will be planted on the grounds of the Champaign County Historical Society in her name. Pictured with her are her husband, Lou, and Urbana Regent Kim Snyder. The Urbana Chapter Daughters of the American Revolution met on Monday, Oct. 15, at the Champaign County Historical Society Museum. In attendance were 18 members and two guests. The meeting was called to order by Regent Kim Snyder. Following the Opening Ritual, the Pledge of Allegiance was led by Carol Tong. Dolly Wisma led the American’s Creed followed by the National Anthem led by Dr. Jan Ebert. The group then proceeded to the grounds of the Historical Society Museum for the program. The program consisted of the dedication of two tree markers as a celebration of our Chapter’s previous leadership. The first tree was a Ginko tree which was planted during the administration of Betty Driever in 1983. A second marker was dedicated at the location of a new Burr Oak tree, yet to be planted, in honor of Honorary Regent Betty Driever. Upon returning to the meeting room, delicious refreshments were enjoyed as the meeting continued. Lou Driever shared the interesting personal story of the Drievers’ efforts in supporting reforestation. In some years, as many as 1000 seedlings were planted on their property. President General’s Message: The President General’s Message was given by Cheryl Walter. Her thoughts reminded members of the beautiful fall season as a time to begin the Chapter’s year by posting activities related to the National DAR Day of Service on social media. We are an organization of service and are striving toward our goal of nineteen million hours reflecting the 19th Amendment which provides for the vote for women. National Defense Report: The National Defense Report was given by Margaret Denzer. This report mentioned that the Margaret Cochran Corbin Award was presented to Vice Admiral Nora Tyson, USN Retired, who was the first woman to lead a U.S. ship fleet when she was installed as commander of the Navy’s Third Fleet in 2015. Secretary’s Report: The October minutes were approved as written. Regent’s Report: Regent Snyder reminded members that dues are due the first meeting in September which was September 17 this year. She went on to say that October 11 is Founders Day, the anniversary of the beginning of DAR. This year, our Chapter has chosen to be involved with the Honor Flight program. Members were thanked for participation in the recent downtown Urbana Hoopla Parade. There has been recent discussion regarding replacement of DAR signs at the Urbana City Gate. A committee will be working on this project in coming months. Regent Snyder reported that she had given her WWI Code Talkers presentation at the Lagonda Chapter DAR meeting in Springfield, Ohio. It was well received. On Sunday, October 14, Regent Snyder, Pat Detwiler, Judi Henson, Dona Tullis and Megan Snyder attended the Oxford Caroline Scott statue rededication in Oxford, Ohio. Caroline Scott Harrison was not only a First Lady from Ohio, but also our first DAR President General. Lastly, Regent Snyder commended members on achieving the status of Cardinal on the State Honor Roll. Chaplain’s Report: The chaplain’s report was given by Theisa Dohner. Treasurer’s Report: The report will be filed for audit. Historian’s Report: Dr. Janet Ebert reminded the group that the Champaign County Cemetery Restoration Project, LLC, is composed of 1/3 DAR members, 1/3 Historical Society members and 1/3 members of Buckskin Trail Boy Scouts. She expressed the need for volunteers to assist with refreshments at the Champaign County Historical Society Museum Open House to be held Sunday, November 4, 2018, 2-4 PM. Wreaths Across America: Chairman, Pat Detwiler, explained that this program began several years ago at Arlington National Cemetery. It now coordinates wreath-laying ceremonies at more than 1,400 locations across the United States, at sea and abroad each year. It is a wonderful opportunity to honor deceased Veterans at the Christmas season. In Oak Dale Cemetery, Urbana, there are more than 1,677 graves of veterans. The local plan is for our Chapter to coordinate with local volunteers and place wreaths in Oak Dale Cemetery, focusing on Soldier’s Mound and the newer designated veteran area. In addition, we will honor the 7 or so Patriot graves, including Simon Kenton and Governor Vance. The wreaths are made in Maine of balsam pine with red velvet ribbon and cost $15.00 each. We are now requesting sponsorship of at least 250 wreaths plus at least 50 volunteers to assist with the placement of them on December 15, 2018. Wreath sponsors and volunteers can contact Pat Detwiler at tdetwiler2@woh.rr.com. Public Relations & Media: Chairman Becky Shultz asked for volunteers to distribute the new Urbana Chapter DAR brochures to various local sites. Service to America: Judi Henson reported that as of meeting date, 1,729 volunteer hours have been recorded for Urbana Chapter DAR. Cheryl Walter announced that Gloria Malone of the Urbana Public Library will be presenting a program at the Champaign County Historical Museum on November 13, 2018 at 6:30 PM. Regent Snyder thanked hostesses for the meeting, which were Judi Henson, Janet Ebert, Betty Driever, Shelly Foulk and Deborah Ruchty. The next meeting will be Saturday, November 17, 2018, 10:00 AM, at the VFW Post 5451 and DAV Chapter 31 Post. Chris Nehring, Ohio Society DAR SW District Director, (Retired) Air Force Technical Sergeant will speak on the history of the WAAC and women’s early involvement in World War II. Veterans are invited to join us.